This space, as quiet as it is most of the year, is a soccer blog. End of year lists and underinformed prognostication are two of the calling cards of the blog genre, so without further ado, here are some predictions for the coming year in Canadian soccer that combine the personal and the banal, the likely and the long shots. Let's begin with a near certainty. I live in one of the host cities for this summer's Women's World Cup, and while Canada won't be paying a visit, Winnipeg will be host to the so-called (inaccurately) Group of Death featuring the USA, Sweden, Australia, and Nigeria, as well as visits from Germany and Japan in the third round of group stage matches. I attended the Canada-USA friendly this past May, and the quality and intensity level were high. 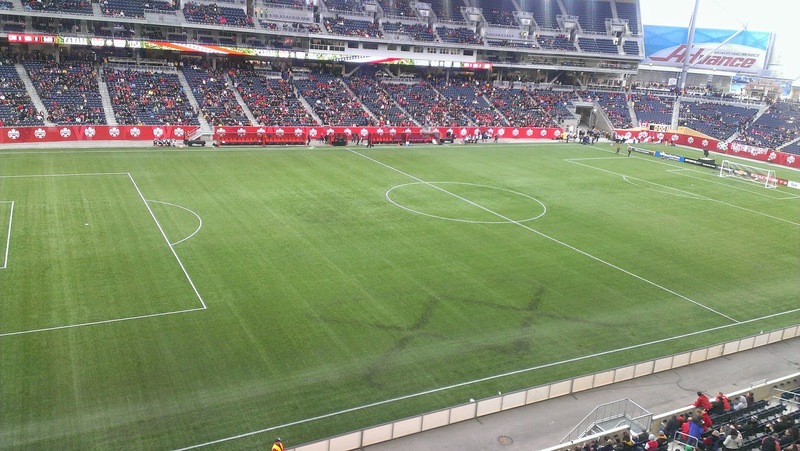 Investors' Group Field looks good done up for soccer. I fully expect Winnipeg to step up and pack the house for all matches, especially the USA games. Canada is a rich country. It is a country that knows how to put on successful international sporting events. Tickets will be sold (mostly), CBC Sports, with few other sports properties to be distracted by, will put its considerable talent and profile behind the tournament. It will be a thing. Update: It is not CBC, but CTV/TSN, another broadcaster starved of its traditional sports properties, that will putting its considerable heft behind making this tournament a television success. The quarters or semis are the likeliest outcome for the team at the tournament, for reasons a more verbose blogger than me has already outlined in considerable detail. Canada's biggest struggle will be finding goals, while a youthful defensive setup should be strong enough to keep the team in matches against all but the strongest opponents. As always, in CONCACAF tournaments, much depends on the 'draw', a term that is used loosely. But with the news that a group, undoubtedly Canada's group, will be hosted at Toronto's BMO Field, there are no excuses for Floro's men not to advance from their group and set up a better than 50-50 shot of winning a quarterfinal match. The national team, despite a lackluster 0-0 draw in Panama, saw general improvement, especially in their defensive setup, in 2014, and I fully expect Floro to push the team to a slightly higher level in 2015. Vancouver made the playoffs in 2012 and 2014, while Montreal made its lone appearance in 2013. Next year will be the first to see two Canadian teams advance. It's easy to see Toronto improving from a season in which they massively underachieved relative to the talent available, while Vancouver is a young team that should improve without any major additions. But don't count out Montreal, a team that improved in the second half of the season, and one that is starting to take on the identity of journeyman MLS manager Frank Klopas. They have the advantage of toiling in the Eastern conference which will feature two expansion teams. Yes, we're getting into wildly optimistic territory here. Doneil Henry has joined West Ham United from Toronto FC after a curious arrangement with a Cypriot team. Another under-23 Canadian will be bought by a first division team in England, Germany, Spain, France, or Italy (but likely one of the first two), and might even play a match or two. Hanson Boakai is a possibility, but surprises are possible. There is enough talent on the Canadian team to qualify out of CONCACAF for next year's tournament in New Zealand. So much depends on the draw, but I don't expect a long tournament run should they qualify. Possibly the biggest long shot of all. A team that overcame the great obstacle of kicking a ball on synthetic instead of natural fibers. The aim was to produce 15 predictions for '15; clearly I haven't being close enough attention to Canadian soccer happenings to find 15 topics upon which to offer my predictions. In any case, should this blog still be around in 2016, I'll be sure to check in and see how I did. Feel free to comment on my predictions or offer your own in the comments. 4. Canada plays best when they come in under the radar, so I think anything can happen on the 15th anniversary of our GC victory. The guessing game comes in with which young guy will have a strong tourney: we need newbies in starring roles. 7. Whitecaps new SA striker ratchets up the expectations in a tough conference, but yeah, I think this is possible. Surely TFC won't sh*t the bed yet again! 8. Disagree, unless the second part of my comment in point 4 happens. And the jury is still out on Henry, imo. 9. They should, but...see first part of comment #4: with a recent bigger time friendly success overseas, the expectations on the U20s seem higher. I have questions about the back line. 10. TFC coaching and management: Anticipating failure since 2007. They already have the new interim coach in place with the Fraser hire, so it's a toss up! 11. Lots of lip service from Caps recently, but yeah, I sense the worse here, too. 13. And Sydney Leroux to score the winner! 15. TFC will opt for young Cancon prospects in their organization and Kyle Bekker will be released following the 2015 season. 16. Nana Attakora will be the comeback player of the year for Canada, so long as the concussion issues are behind him. And (sadly) speaking of concussions, I'd like to make a shout out to Rob Friend, a classic "late bloomer" who made a good career for himself as a STRIKER in Europe but was a highly polarizing figure for the Vees (nary a mention about his retirement). Several years ago I remember watching him play for Kelowna in the summer PCSL and not thinking he was any great shakes and yet he went from there to become a successful pro (which reminds me, for which Tim Horton's is Jaime Peters working?). Here's hoping the concussion issues go away for him as embarks upon a new career with his growing family. You're now right on #3, let's see how #4 plays out. #1. Embarrassingly work commitments, apathy, and throngs of American fans prevented me from attending any of the World Cup matches in Winnipeg. #6. De Rosario hung on a month too long for me to be right (but banged in two goals against Iceland for good measure). #9. U-20 qualification was a flop. #11. Too early to say for sure, but Toronto and Montreal's Canadian numbers are significantly down (in the neighbourhood of 5% each), while Vancouver's are up only slightly. #12. Again, too early to say for sure, but now a whole Canadian league seems more likely. #2. Despite some smallish crowds, mostly on weekday afternoons, this World Cup has to be considered a success, some Wambachian grousing notwithstanding. #3. Canada did not win and, in fact, bowed out about when I expected they would. #13. USA won. Big time. Seems I nailed all my WWC predictions. More wrong than right, which seems about right for me. #4 Not a strong GC and I was surprised by that but you can't win if you don't score and we haven't done so since DeRo's penalty vs Panama in 2011. Based on his rookie MLS form Larin looked like he might be the breakthrough guy but his confidence went downhill after his miss vs ES. #15 (from my list) saw Bekker jettisoned from TFC before the season began and since has been moved on to the Impact, where he has yet to make an appearence on the subs' bench. Yet, Floro felt he was his best option to start in place of the injured JDG in the ES match, but then he never saw the field again, with so Spaniard preferring another CB (Hainault) as a midfield sub in both of the next matches. My new 15(a) prediction is that Bekker will be out of MLS by season's end: international designation makes him a less attractive journeyman depth option south of the border and I just don't see him having any more ceiling.